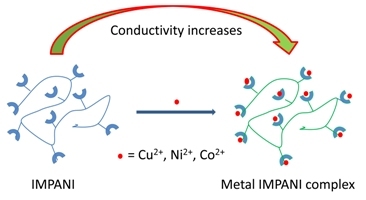 A polyaniline containing imidazole in its backbone (IMPANI) has been synthesized by a series of chemical reactions and has been used for evaluating metal ion sensing properties. The coordination of metal ions to this imidazole functional group present in the IMPANI side chain results in an increase of conductivity due to secondary ion generation and it facilitates the metal ion sensing. Films prepared using IMPANI blended with polyaniline emeraldine base (PANI-EB), have been used for electrical conductivity measurements as a function of metal ion concentration and doping time. Significant responses have been observed for copper, nickel and cobalt ions at and beyond 10 mM concentrations in aqueous solution.